I was on Facebook and noticed that one of my friends became a "fan of" Sonic and I got to thinking about onion rings. 30 minutes later this is the trouble I got myself into in the kitchen! My kind of trouble!!!! those look yumo!!!! You made those in 30 minutes?! 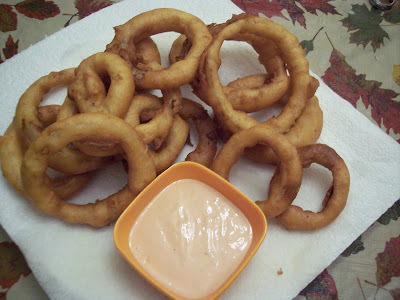 Anytime I make onion rings, they don't look that nice NOR do they take 30 minutes! They look delicious! I love onion rings. But I don't like to dip them in anything. Girl, Sonic is your friend! what kind of sauce is that? is it spicy?